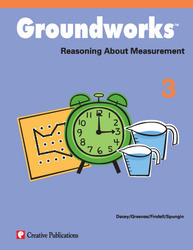 The five big ideas of measurement are presented: units, measurement sense, conversions, scale, and formulas. Fifteen 8-page sections relate to these five big ideas. Each section contains teacher information, six reproducible student pages, and solutions for all problems. The teacher information includes teaching help/tips for the first student problem and the six reproducible student pages are based on the same activity, ranging from easier to harder.